It's Lawn Fawn Release week! All those fun products revealed at Creativation will be available very soon and we have a week of inspiration to share with you so you can get those creative juices flowing. Today we are featuring the super cute Rub-A-Dub-Dub set as well as the new Quilted Backdrop die that is just amazing!!!! For my first card, I wanted to create a serious bubble filled bathroom. 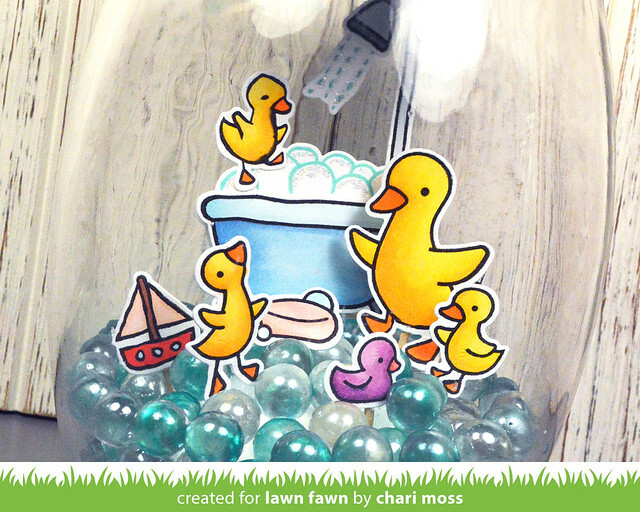 I just saw these cute little ducks playing in a bubble bath and totally getting out of hand. 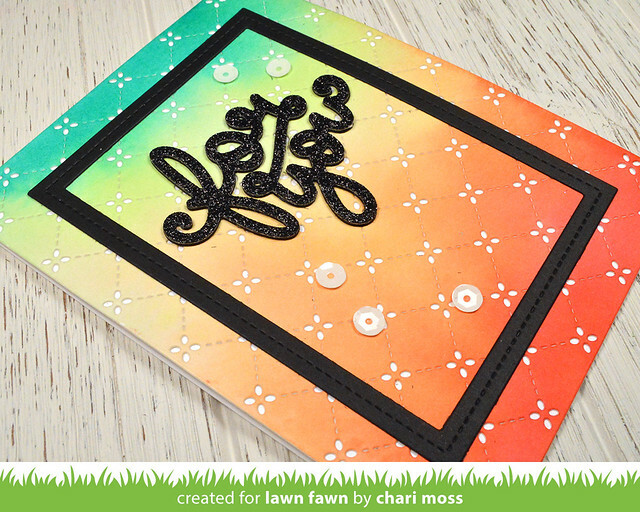 So I created a floor full of bubbles using the Puffy Cloud Border die with Moonstone and Vellum cardstock. 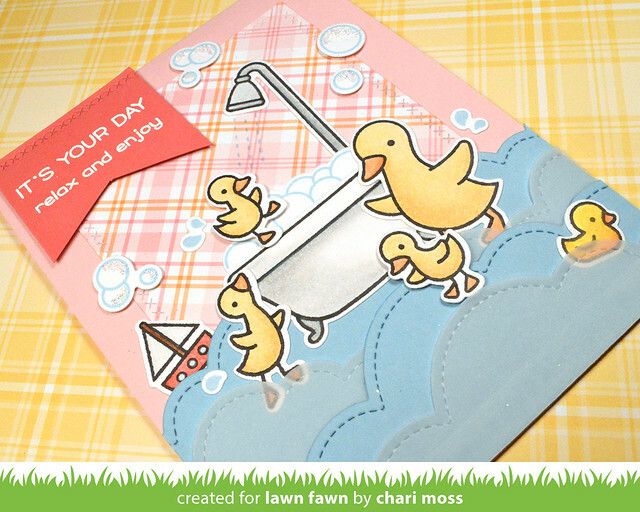 The plaid background from Perfectly Plaid Spring paper frames this little scene so nicely and I love the plaid with the little yellow ducks. I added some Prisma glitter with a quickie glue pen to capture that soapy sheen always seen on bubbles. For Creativation I also create some fun scenes in glass jars to decorate the booth. I wanted to create the same look of a floor full of bubbles and I accomplished this with marbles. I died some of them with various blue alcohol inks so that I had a variety of colors. I colored all my images with Copic markers and cut them out with the matching dies. Each image is hot glued to a toothpick secured in a styrofoam piece buried under my marbles. One this last project I really wanted to make the beautiful die cut Quilted Backdrop the star of the show. 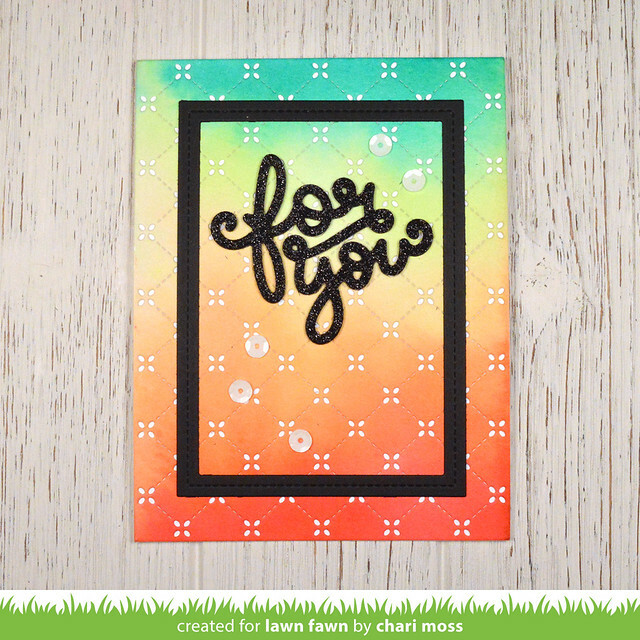 For this card I did some ink smooshing by applying distress inks directly to an acrylic block, spraying it with water then setting it ink side down on a piece of watercolor paper. I left it there for awhile to drive so that my colors didn't bleed together or pool up when the block was removed. After all the ink was dry I cut it with the Quilted Backdrop then layered it onto a white card base so the detail of the die cut could be seen. I finished it off with a simple die cut sentiment from glitter paper, a stitched frame and a few cream colored sequins. Be sure to check out the Lawn Fawn blog for more projects with these new products as well as giveaways! Thanks for stopping by today! All new products will be available starting February 22. Fabulous creations! I love your rub-a-dub in the jar with the marble bubbles! Your For You card is stunning. I love the blending and colors with the quilted background. The colors on the quilted background are just gorgeous! I can't wait to get that die! 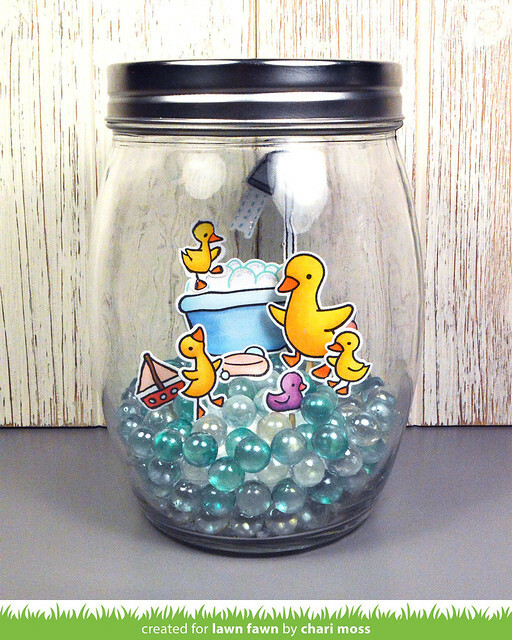 Your duckie card and jar are adorable! The jar scene would be a perfect centerpiece at a baby shower. So creative!